LIC Jeevan Lakshya Plan is a non-linked plan which offers both the protection and savings. People who wish to give security to their family can buy this plan because it is a combination of protection and Savings. Everyone wants to give a secured future to their family. For those people, this is a good plan to buy. This plan provides annual income benefit to your family. These benefits are very useful for your children in case of unfortunate or sudden death of the policyholder at any time before maturity. LIC Jeevan Lakshya 833 Plan gives a lump sum amount at any time of maturity irrespective survival of the policyholder. LIC Jeevan Lakshya Policy has its UIN. The Unique Identification Number is 512N297V01. Check the complete details like Eligibility Criteria, Benefits, Premium Modes, etc. in the following sections. LIC India has differentiated the Features and Benefits for every plan. These features help the people to understand about the Policy. Death Benefit:“Sum Assured on Death” + vested Simple Reversionary Bonuses + Final Additional Bonus (FAB), if any. The sum assured will be payable on the due date of maturity. Based on the following circumstances The Death benefit will be paid. This will be payable from the policy anniversary coinciding with/ following the date of death of LA (Life Assured) till the policy before the date of maturity. Absolute Amount= 110% of the Basic Assured. Along with this, the vested Simple Reversionary Bonuses and Final Additional Bonus(if any) will be included in the Death Benefit and will be payable on the due date of maturity. If the Policyholder survives till the end of the policy, the maturity benefit will be provided. Maturity Benefit: “Sum Assured on Maturity” + vested Simple Reversionary Bonuses + Final Additional Bonus (FAB), if any. This Maturity Benefit will be payable in lump sum on survival to the end of the policy term if all the premiums have paid completely. Note: The Rider Sum Assured should not exceed the Basic SA. If the Policyholder doesn’t pay the premium within the time, the company will extend the time to pay the premium is a grace period. LIC Jeevan Lakshya 833 Plan has the grace period of 30 days. Assured candidate can pay the premium within this Grace Period. If the insured candidate wants to return the policy within the Minimum Policy Term, the surrender value will be paid to the policyholder. LIC Jeevan Lakshya Plan has some eligibility conditions regarding the entry age, sum assured, policy term, etc. Check the Eligibility conditions for the LIC Lakshya 833 Term Insurance Plan. LIC Lakshya Jeevan 2 Plan has some Premium rates per Rs.1000 sum assured. Go through the following table for complete details. To Calculate the Premium of LIC Endowment plan, you need some basic information like Name, Number, Email Id, Policy Term, etc. Based on the Policy Term and other parameters policyholders can you can calculate the LIC Lakshya Jeevan 833 Premium. How to buy LIC Jeevan Lakshya 833 Plan? The policyholder can visit the nearest LIC Branch Office to buy the Proposal form. Or you can go through the online to purchase the Policy. You can also get the Jeevan Lakshya LIC Plan through the Agent. Nominees can claim for the LIC Jeevan Lakshya policy after the death of the policyholder or after the completion of Premium Mode. If the policyholder pays the premium for three full consecutive years and remaining subsequent premiums are not duly paid will not fully void, but shall subsist as a paid-up policy. If the benefit is paid after the death of the life assured under the paid-up policy then it is known as Death Sum Assured Paid Up Value. [(Number of premiums paid/Total Number of premiums payable) x Absolute amount assured to be paid on death] which will be payable on the date of maturity. Reduced Income Benefit= 10% of Basic Sum assured x (Number of premiums paid/Total Number of premiums payable) shall be payable from the policy anniversary coinciding with or following the date of death of Life Assured till the policy anniversary before the date of maturity. The Sum Assured on Maturity under paid-up policy shall be reduced to such a sum is known as Maturity Paid Up Sum Assured. Maturity Paid Up Sum Assured= Sum Assured on Maturity * (no. of premiums paid / no. of premiums payable). A Paid Up will nor accrue any further bonuses. Riders will not acquire any paid-up value. Loan: There is a loan facility under this LIC Jeevan Lakshya Plan. Taxes: Taxes are applicable (if any) based on the Taxes law and Rate of Taxes will be applicable time to time. The Guaranteed Surrender Value= (% of total premiums paid (net of taxes)) – any extra premiums and premiums for riders, if opted for. The Special Surrender Value= discounted value of the sum of Maturity Paid-up Sum Assured and the vested Simple Reversionary Bonuses if any. 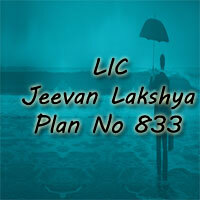 Assisgnments and Nominations are available under this LIC Jeevan Lakshya plan. Is Lic Jeevan Lakshya Policy eligible for CEIS Rebate?